big, big, BIG Stampin' Up news!!! Here are some samples from the new "Awash with Flowers" set... it comes in either Wood Mount or Clear, and is a sneak peek from the new Idea book and Catalogue that comes out July 1st! You can also get it free by putting in an order for $460... which seems like a lot, but you can combine orders with friends! 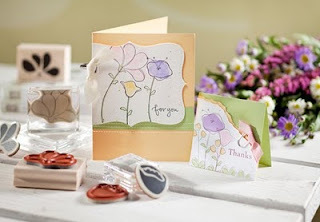 Check out this link for more amazing spring deals: http://www.stampinup.com/ca/enc/16536.asp. I was also checking out the clearance rack on stampin' up's website, and saw some pretty amazing deals! 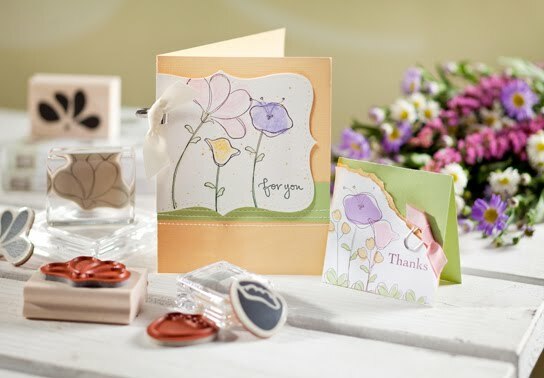 The link to the clearance rack is: http://www.stampinup.com/ECWeb/ItemList.aspx?categoryID=494&cid=89 These are products that are retired, but still coordinate with your projects... and they are up to 60% off! You don't want to miss these deals, so check them out, and email me at yummy_starbucks@yahoo.ca to put in an order!